Relax on this beautiful rocking chair porch, have it all with this Cape Cod style home with white picket fence, Located in Chamblee's "Keswick Village" neighborhood. 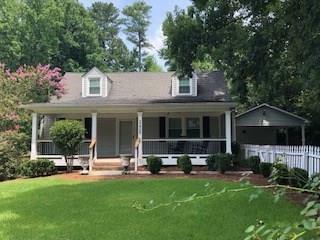 Home features: Freshly painted, vaulted ceilings in LR, hardwood flrs, plantation shutters thru-out, upstairs nursery/office, enormous upstairs master expanding the length of the home, incredible landscaping, large fenced in backyard, 2 Carport W/storage. steps to park and convenient to Brookhaven/Buckhead. Directions: Peachtree Industrial To Johnson Ferry To R On Keswick Dr. House On Left.